The models looked diseased; obliterated it seems, into both Kusama’s imagination and our reality, where coloured circles on skin connote clown-like humour, but also illness and plague. 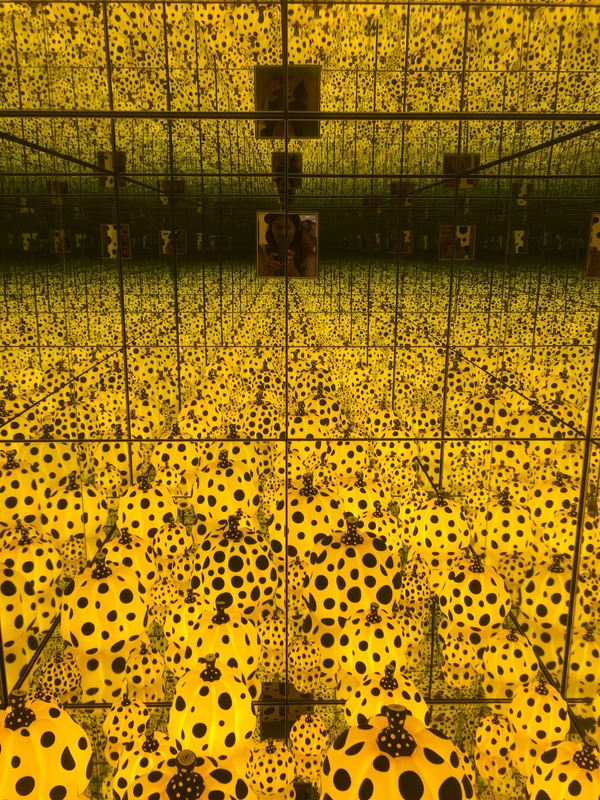 Consider also Kusama’s position as the fully – clothed female artist, directing the proceedings as well as the objectifying gaze of the audience to both her male and female models. These are empowering images from both a feminist and minority perspective, manifesting madness, delight, freedom, insubordination and corruptive rot, all at the same time. The Spirits of the Pumpkins Descended into the Heavens (2017). Look through the peephole, and you’ll find an endless psychedelic pumpkin field. If you’d like to hear about some of these works from the great lady herself, check out this short BBC interview. (Added bonus for those of us of a certain vintage : it features comments from the very excellent Peter Gabriel).